Yarn does not grow on trees (if only… that would be amazing. Scientists: get on that). And there are only so many hours in the day. It’s still relatively early in December, but you are probably starting to feel the pinch. Obviously, knitting big projects takes more time than knitting little projects (because… duh), so banging out a sweater in two weeks (while that would be amazing) is probably not going to happen. When I want to make someone a knitted gift, my usual go-tos are knitted accessories: hats, mittens/gloves, and scarves. Accessories are always useful, appreciated, don’t usually need to be washed (and potentially ruined), and are small enough that you can finish a project in the time it takes to watch a Sunday marathon of Law & Order. I’ve undertaken a semi-scientific* study of some of the knitted accessories I have sitting in a box in my closet. I wanted to see about how much yarn I used in each project, but I didn’t want to unravel everything and measure it out (because I’m not a masochist). Instead, I broke out the kitchen scale and weighed each item, which will let me estimate of how much yarn each type of project requires. A scarf uses about 2 to 3 times as much yarn as a hat or a pair of mittens. So, if you’re trying to save money, time, and yarn, try making a gift hat. If you’re feeling generous, how about a nice long scarf? 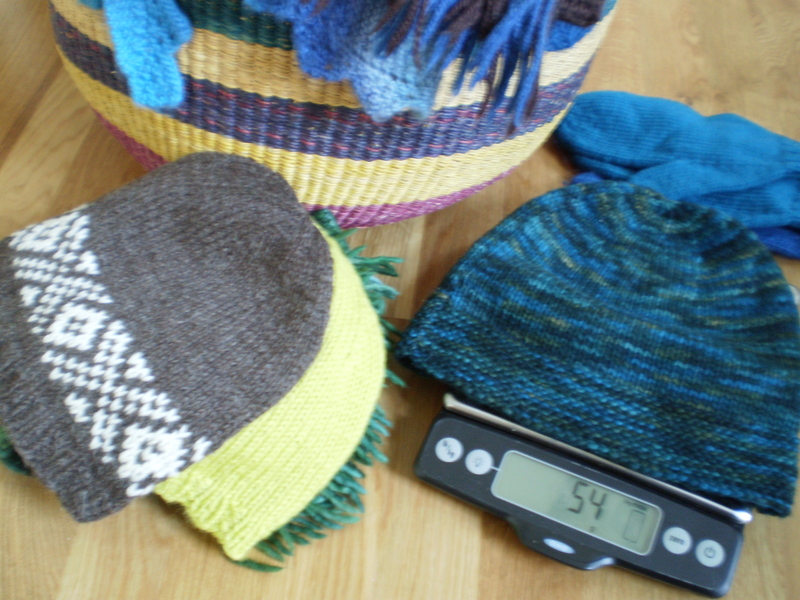 **I measured three of each item all knit with worsted-ish yarn (three pairs of mittens, three scarves, three hats) and averaged the weights. ***Note: my mittens were knit at a slightly finer gauge than my hats and scarves. So while they may weighed the same, the mittens used more yardage, and probably took more time to knit up. This entry was posted in FYI and tagged accessories, christmas, gift, gifts, hats, mittens, scarves, weight, worsted, yardage on December 6, 2013 by onemilljellybeans.